REWA is a self-taught Nigerian artist born in 1987. She grew up in London and started her professional career here before moving back to the continent. She currently travels extensively but spends most of her time in her country of birth - Nigeria. Rewa uses art as a form of therapy. It brings her peacefulness and represents the visual diary of her feelings and of her life. REWA's main subject matter is "Woman" and she celebrates her in all of her varied forms. 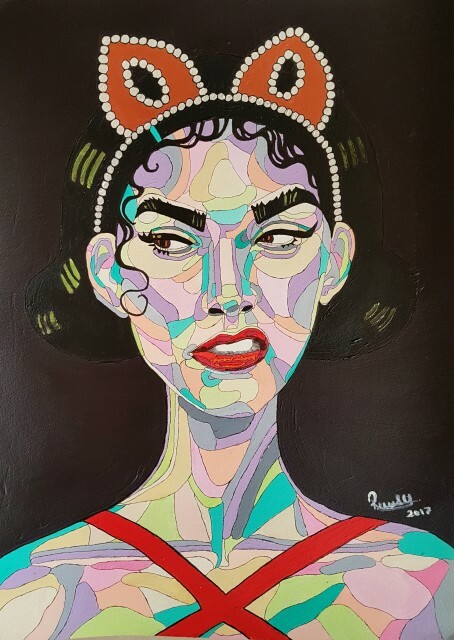 By portraying her own emotions and feelings in her women subjects, she acknowledges the female genre and introduces the audience to the strength, beauty and diversity of female identity. Each of her women is unique and Rewa's visual embodiment of them showcases their varied emotions. REWA's preferred medias are acrylics and watercolours on cartridge paper, - she likes the immediacy, proximity and transparency they provide. The vibrant colours she uses give a unique edge to her work and she subconsciously embellishes her women with her own spirit via her colour choices.